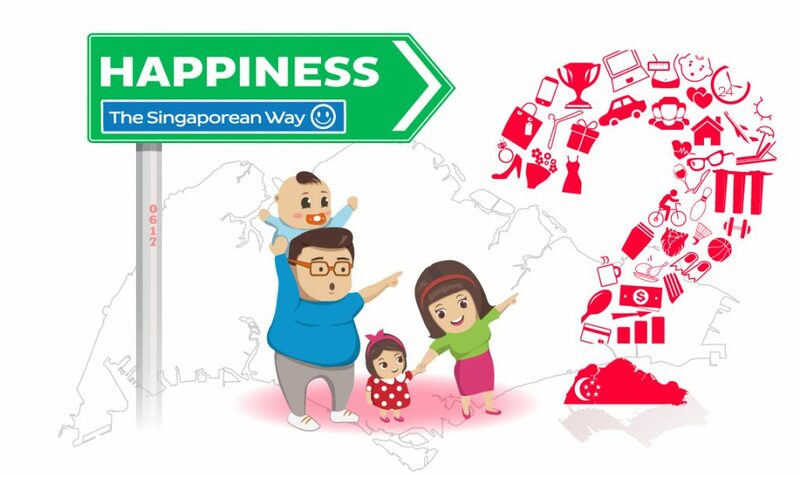 Home / Survey Findings / Happiness, the Singaporean way? The Singapore story for the first 50 years is known as one of remarkable progress and GDP growth. Today, Singapore tops global rankings in everything from airports to business and infrastructure. But when it comes to the well-being of our people, how do we fare? Following SG50, the HappyDot.sg team thought about how we could contribute to Singapore’s next 50 years. To reach SG100, we believe we need to look beyond GDP, and assess Singapore’s well-being with a broader set of indicators. Here are our preliminary findings. 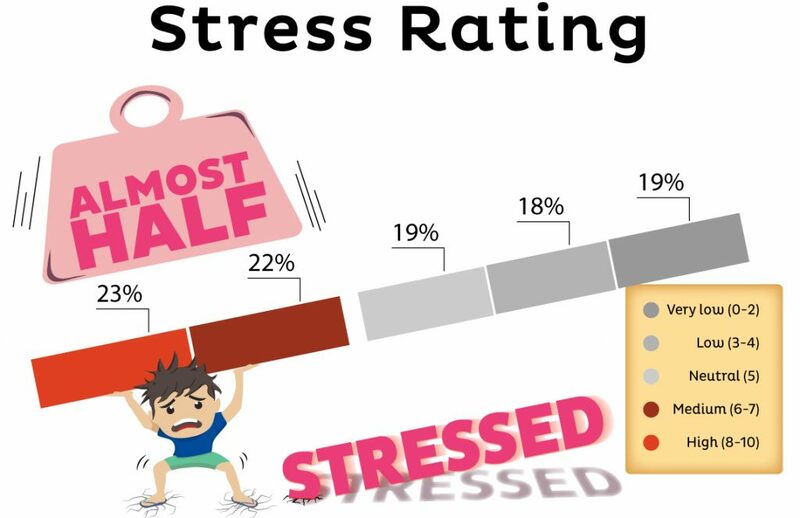 Ask a Singaporean “eh, how are you?” and half the time, the answer will be “wah, very stress.” That’s what our data shows: almost half (44.8%) of respondents rated their overall stress levels as medium or high. No surprises here – after all, Singaporeans are among the world’s hardest working, and we all like to complain about it. However, there is more to our Singapore story. Are Singaporeans happy at all? With all the grumbling, you might think that Singaporeans are quite miserable. Fortunately, that’s not the case. 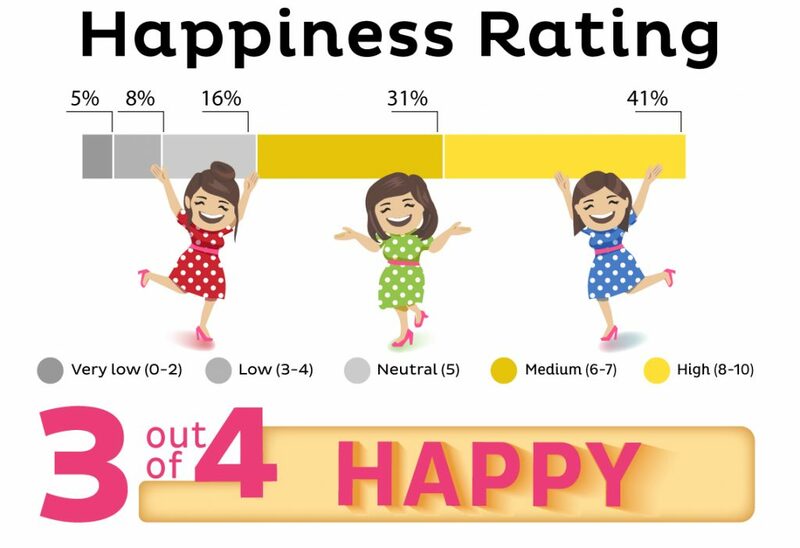 When asked, three in four Singaporeans (72%) reported that they also felt happy in the last few days. Stressed but also happy? Can (apparently)! At least we have a balance: we are not only stressed, all the time. If we want to be number one in everything, perhaps we should improve our global rankings in relaxing too? 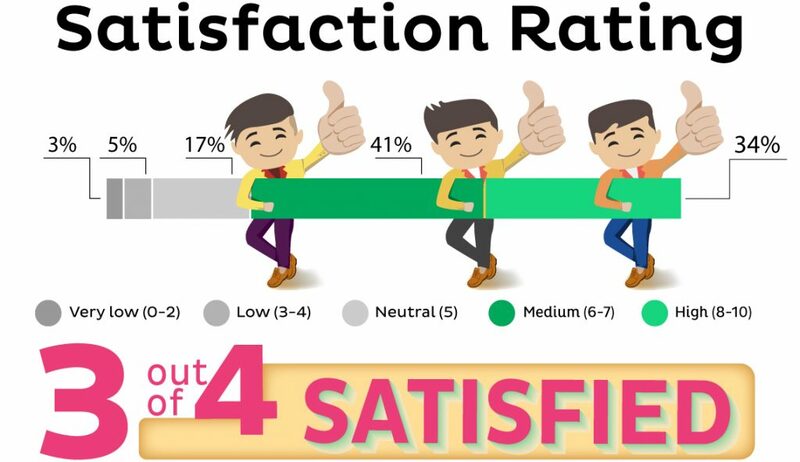 We complain, but three in four (75.5%) Singaporeans rated their overall satisfaction with life as medium or high. Life in the dot is not so bad after all! Specifically, Singaporeans were most satisfied with their safety and security, personal relationships and sense of belonging to Singapore. They were least satisfied with their ability to retire comfortably, level of engagement with public policy, and ability to afford their desired lifestyle. Similar to what other international well-being studies found, our life satisfaction follows a U-shaped curve. 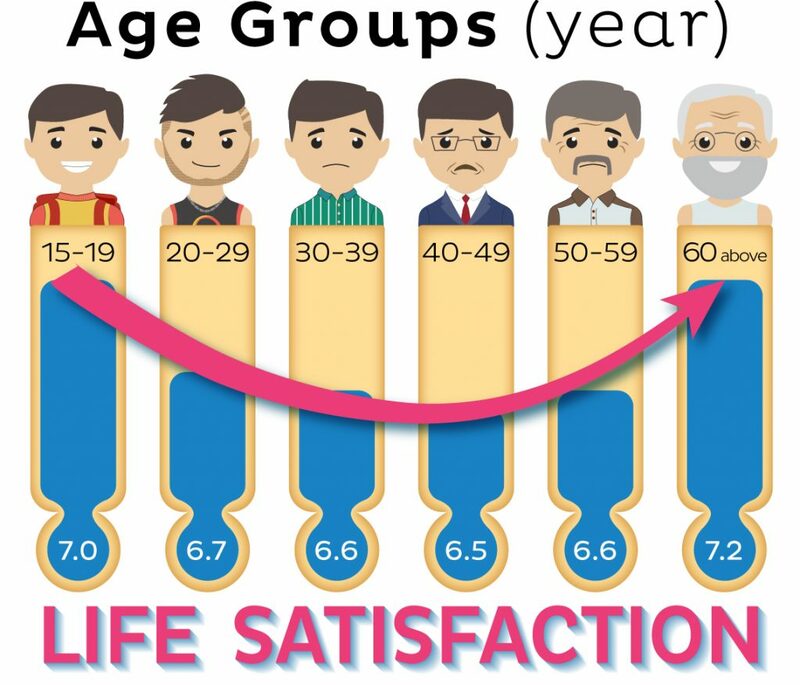 Singaporeans are more satisfied with life as we grow older, with average life satisfaction dipping between 40 – 49 before picking up again. Life can be unpredictable, but at least we know it gets better with age! As we envision SG100, we believe that Singapore’s happiness index is just as important as our GDP. The HappyDot team will continue collecting and refining a set of measures to provide a fuller picture of Singaporeans’ well-being, and how it is changing over time. Come with us on our journey to happiness. Join HappyDot.sg today and contribute to research which makes this dot a happier place! After all – Happiness, the Singaporean way, begins with you and me. 1Results are based on the responses of 2384 Singaporeans collected from Dec 2015 – Feb 2016. Weighted results are representative of the Singapore Resident population by gender, age and race. 3Where zero is ‘not at all’ and 10 is completely. 4Where zero is ‘never’ and 10 is ‘always’.